I’d like to share further insights gleaned from clinical practice, informed by the evidence – and offer a bit of paradigm shift in the way we approach and manage tendinopathies. Here is a précis of my presentation at the recent Canberra APA Research Symposium. Tendinopathies continue to be an increasingly common clinical presentation and may account for around 30% of musculoskeletal complaints presenting to the general medical practitioner. [i] They are notoriously difficult and frustrating to treat – and recurrence is common. [ii] Despite an increasing body of science, their aetiology remains obscure. Could the problem lies somewhere in between the tendon in the periphery and the CNS? Spinal dysfunction is ‘the’ underlying driver of most tendinopathies – it is the adverse spinal loading and ‘overuse’ (which occurs in typical patterns) – which in turn goes on to affect peripheral function. Tendinopathies – (and other diverse symptoms) can result. HOW? : – Altered spinal loading and movement patterns lead to adverse ‘segmental bother’, and the potential for ‘sub-clinical’ or actual neural irritation and pain and disturbed function in various tissues throughout the segment’s ‘innervation postcode. Treatment approaches which address the more proximal spino-pelvic dysfunction via tailored manual and exercise therapy can significantly alter the peripheral pain and tissue dysfunction – which then become more amenable to direct treatment and loading – yielding better outcomes in a shorter time frame. The potential role of the spine in the aetiology and patho-physiology of tendinopathy has been little considered to date. This is strange as the spine is ‘the’ fundamental support involved in all movement! Its health is vulnerable to changes in motor behaviour. 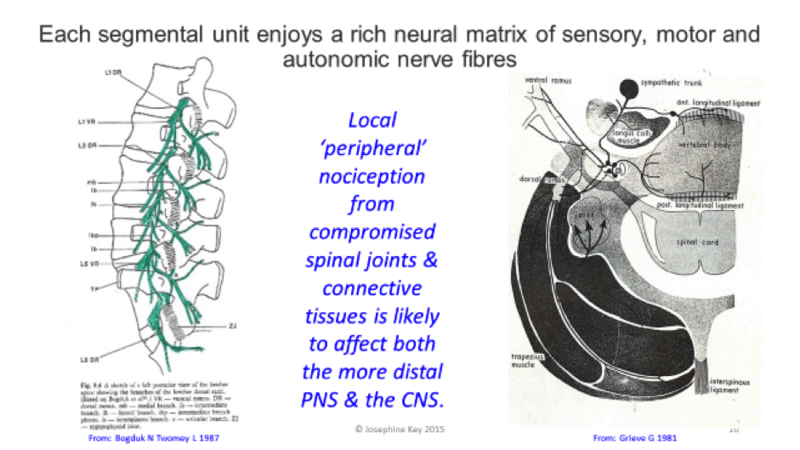 The spine houses a significant part of the CNS – yet its control is supported by the PNS – the spine itself its part of ‘the periphery’! It can also further generate the peripheral changes which are part of the tendinopathy picture and lead to the functional changes in the nervous system associated with tendinopathy. More recent studies illustrate CNS, spinal segmental and peripheral nervous system involvement in the pathophysiology of tendinopathy. However, is the conclusion drawn by the researchers cause or effect? – of course altered peripheral afference will affect the CNS – but… is the cause of the peripheral problem spinal dysfunction? It’s a vicious cycle! The SNS can respond bilaterally to unilateral stimuli [xiv] (this may help explain why 41% people with achilles tendon pain later developed pain on hitherto painless other side). Unilateral lateral epicondylalgia cohort all demonstrated bilateral widespread mechanical hyperalgesia. [xxxiv] Thermal hyperalgesia distinguished those with severe pain. Yet spinal dysfunction is a prime source of sympathetic upregulation! Fascia research is a rapidly evolving field. Fascial network – is a tensegrity structure for transferring load, dissipating force and spring loading for movement efficiency – tendons are part of fascial network!. Increased basal tension and lack of ‘slide’ in the fascial system diminishes force generation, mechano-sensory fine tuning and can be a potent source of nociception due to the predominance of ‘wide dynamic range’ neurons [xxxv] – especially in inflammation[xxxvi]. Pain over the tendon may be caused by more proximal fascial dysfunction [xxxvii] [xxxviii]– There is increasing interest in the role of the paratendinous tissues [xxxix]. Increased para-tendon thickness has been shown in in achilles tendinopathy [xl] by US imaging. Clinically spinal dysfunction is linked to dysfunction through the lower limb fascial system. So…. 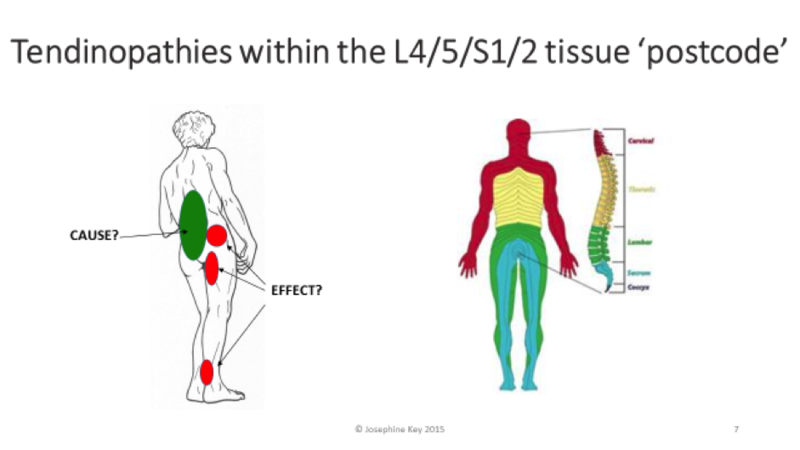 which factors point to the probable role of spinal dysfunction in lower limb tendinopathies? Essentially this looks at HOW the individual’s axial movement system FUNCTIONS! Gym attendance!! – BIG dysfunction factories! (and often Pilates – and sometimes yoga). The gym philosophy is ‘all about strength’ rather than control. On the whole there is poor exercise prescription – with little focus on the deep muscle system. Instead, most protocols activate the more superficial global muscle system – pretty much all with effort – and breath-holding! These global dominant movement patterns are learned – and become indelibly imprinted in CNS. Yet the research is clearly telling up that people with back pain disorders have an underactive deep system and propensity to overactive global superficial muscle activity! Presence of ‘tell-tale signs’ over the posterior torso: Central Posterior Cinch [xli]; muscle contours including a ‘Key Sign’ etc. Postural collapse in sitting – is universal! Increased muscle tone around spine is readily apparent ‘at rest’ when recumbent – and this is associated with fascial dysfunction – “Where there is smoke there is fire”! When positive, local stiffness, tension & reactivity in relevant joints & related soft tissues is found – & probably acute local allodynia & autonomic changes. However, it is important to appreciate that provocation of peripheral pain referral is rare. Increased resting tone and fascial dysfunction may well be apparent in the relevant ‘innervation postcode’? Understanding the wide reach of spinal dysfunction and managing tendinopathies as part of a more regional and global movement dysfunction may improve outcomes. The Key Approach Model for tendinopathies, as outlined, sheds light on the aetiology of lower limb tendinopathies by outlining the intrinsic risk factors which may predispose to soft tissue break down. It also has implications for exercise prescription and prevention. And offers scope for future research. [xii] Lim et al 2012. Evidence of spinal cord hyper-excitability as measured with nociceptive flexion reflex (NFR) threshold in chronic lateral epicondylalgia with or without a positive neurodynamic test. J Pain; 13:676–84. [xiv] Andersson et al 2011. Tenocyte hyper-cellularity and vascular proliferation in a rabbit model of tendinopathy: contralateral effects suggest the involvement of central neuronal mechanisms. Br J Sports Med 45:399–406. [xvii] Hodges PW, Richardson CA 1996. Inefficient muscular stabilisation of the lumbar spine associated with low back pain: a motor control evaluation of transversus abdominis. Spine 21, 2640–2650. [xxvii] Lim et al 2012. Evidence of spinal cord hyper-excitability as measured with nociceptive flexion reflex (NFR) threshold in chronic lateral epicondylalgia with or without a positive neurodynamic test. J Pain; 13:676–84.